When the prop got there, however, the captains of 11 other countries were hanging around too. Pure awkward. Fiona Coghlan pictured at Champ de Mars Park in Paris today. IRELAND WOMEN CAPTAIN Fiona Coghlan was hoping for a bit of alone time with the World Cup trophy, at the Eiffel Tower, this afternoon but rivals kept cramping her style. Coghlan was one of 12 captains assembled at Champ de Mars Park in Paris for an official photocall event. The experienced prop posed for group pictures with the famous, 127-year-old landmark before putting on her serious face for country versus country snaps. Up first for Philip Doyle’s charges are the USA, this Friday, so Coghlan stood opposite Shaina Turley. Ireland’s remaining group fixtures are against the world champions New Zealand, led by Fiao’o Faamausili, and Kazakhstan, captained by Anna Yakovleva. Email “Ireland captain Fiona Coghlan takes World Cup trophy to visit Eiffel Tower”. 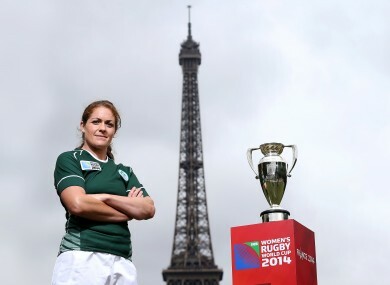 Feedback on “Ireland captain Fiona Coghlan takes World Cup trophy to visit Eiffel Tower”.